The boy is going to catch the ball. 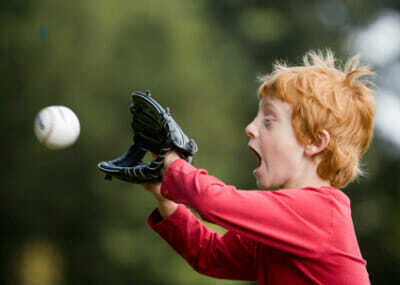 The word catch is used for the action in the picture above – to receive a ball (or another object) that someone throws to you. However, there are a number of other meanings and expressions with the word catch – here are 8 of them! To get sick with a cold (a minor respiratory infection). To try to breathe normally after hard exercise. When something comes into contact with fire and starts to burn. To discover someone doing something wrong or illegal at the moment they are doing it. To make eye contact, or to attract attention.